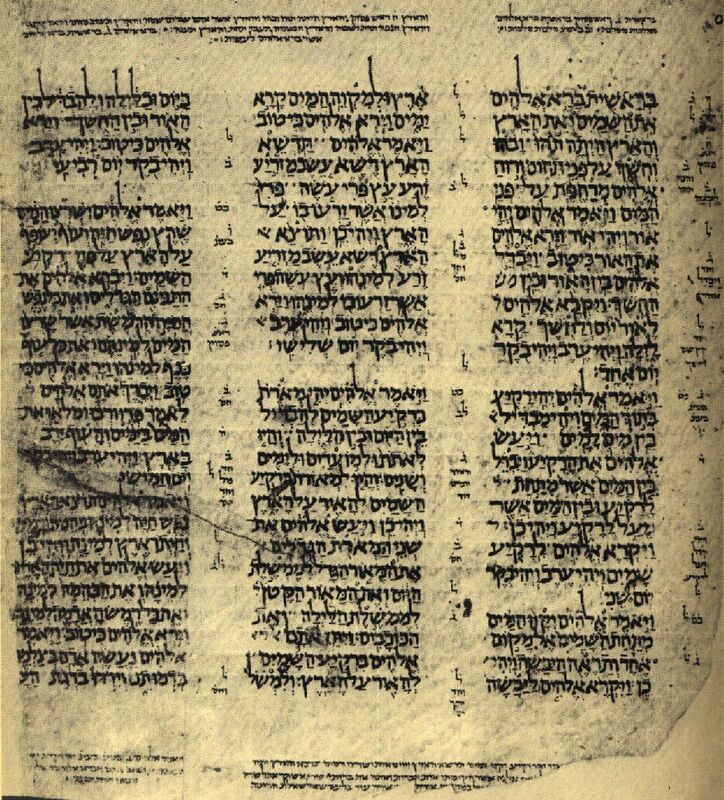 Genesis 1 in the Leningrad Codex, the oldest extant Hebrew Masoretic manuscript of the entire Old Testament. Genesis 1:1,2 are at the top of the right-hand column. In just the first two verses of the Bible, God actually tells us quite a lot about himself. Let’s unpack these verses and get properly introduced to the only true God. These four words tell us that God is eternal. If at the beginning of all things, God was already there, then he exists outside of time and does not have a beginning himself. He does not tire or wear out; he does not grow old or die. He lives in the eternal now. When we ask, “What was God doing before the beginning?” we are immediately confronted with how limited our human understanding is. Time is God’s creation that didn’t exist until the beginning, so how can we talk about what God was doing before the beginning? Before is a time word, so there is technically no such thing as “before the beginning.” We cannot imagine God sitting around twiddling his thumbs for thousands of years, because there were no years or other units of time before he created the universe. From a realm outside of time, God brought time into existence. Moses does not say, “In the beginning God was there. And then God created.” No, from the very first moment of time, God was working. He is not idle, but active. We also learn something else about God here, but not in English. The Hebrew word for “God” is plural, but the Hebrew word for “created” is singular. So literally, the verse translates something like, “In the beginning the one who are God created.” The creator is referred to as more than one, yet the creating is actually done by only one being. So already in the first five words of the Bible we have a hint that the true God is a trinity – three persons in one God, and one God in three persons. Even though we cannot logically understand how this can be, it does assure us that humans did not invent God, but that he invented us. Our trust in him is therefore not just an optimistic wish or a placebo to help us get through life, but is anchored in the actual, eternal Lord of the universe. Moses is not merely summarizing the rest of the chapter here. He is talking about God’s first distinct action on day 1 of the universe’s existence. “The heavens” here are the heavenly and spiritual realm (perhaps including the angels – Job 38:4-7). It is where God dwells, but God did not prepare it for himself; it was “prepared for you [the elect] since the creation of the world” (Matthew 25:34). Just think: Even though God is going to create a perfect and beautiful home for Adam and Eve on earth, he already knows they are going to fall into sin and drag all of humanity into sin with them, and he has already planned to send them his Son to save them from their sins, and so the very first thing God creates is the eternal home where all those who believe in Jesus will dwell in his presence. So we also see already that God is loving and gracious. Even though this will be even more applicable later, when God takes what is “formless and empty” (vs. 2) and gives it shape and adorns and fills it with beauty and life, let’s pause right here for a moment and ponder that word “created.” Everything we make, we make from something else, using mind and abilities that have been given to us, and basing it on a pattern that itself is based on past patterns or things that already exist. Even when we play make-believe, we do so using things with which we’re already familiar. God, however, created the heavens and earth out of absolutely nothing, and he had no pattern to work with for anything that first week. Think, for instance, of the symmetry and beauty of a human face; God had no human faces to pattern our faces after. God first creates a pattern for the heavens and the earth and everything else in them, in his own mind, and then flawlessly executes his creation on the basis of that pattern. (All human art forms, at their best, are nothing more, or less, than imitation of God’s patterns.) God is therefore incredibly knowledgable and wise. Moses now focuses our attention on the earth, the physical realm. At first it was an indistinguishable, watery mass of raw materials. What exactly these raw materials and dark watery abyss looked like, we can only begin to imagine. It is hard for us to imagine anything without form, or an earth that is empty. But God deliberately created the physical universe as a dark and indistinguishable mess at first, so that he could demonstrate for us that he is not a God of chaos, but of order. He is going to take this indistinguishable mess and bring inexpressible order and beauty to it. We do well to remember this act of God on day 1 of creation when our lives seem to be a dark mess. God may have deliberately placed the mess there precisely so that he can show himself to us as a God who brings indescribable order and beauty out of mess. …and the Spirit of God was hovering over the waters. Here we are introduced to one of the persons in God, one of the persons in the Trinity, “the Spirit of God.” Moses says that he was hovering over the waters. What exactly was the Spirit doing by hovering? The Bible also uses the word hover to describe what a mother griffon vulture does after nudging her fledglings out of their nest to give them their first lesson in flying. She hovers over them to protect them, ready to swoop down and catch them at a moment’s notice when they tire (Deuteronomy 32:10,11). So here we clearly have the first example of what is called anthropomorphism – ascribing physical attributes and actions to God to help us understand God. The Spirit of God obviously wasn’t hovering in some physical location, because by very definition spirit is the opposite of anything physical. God uses this word to describe his Spirit’s protection of his creation from the beginning. The Spirit is ready to act at a moment’s notice in harmony with God the Father to create and bring order and life to this formless mass of material. Now that you’ve been properly introduced, please join us for worship to get better acquainted with your eternal, active, loving, gracious, knowledgable, wise, orderly, triune God.